Inventory and Monitoring Biodiversity within High Elevation Cloud Forests of Reserva Natural Mesenia-Paramillo, Colombia. 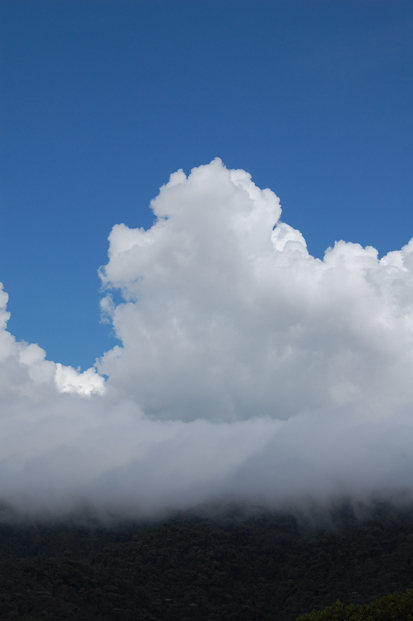 Montane cloud forest at Reserva Natural Mesenia-Paramillo. © 2011 Ted R. Kahn. A joint conservation effort between Neotropical Conservation Foundation, Fundación Colibri, and Saving Species. Reserva Natural Mesenia-Paramillo is a community-based conservation reserve located within the Tatamá-Caramanta Biological Corridor. It currently consists of 2,000 contiguous hectares overlapping the Departamentos of Antioquia, Chocó, Risaralda and Caldas in the northwestern western cordillera of the Colombian Tropical Andes. It contains two important watersheds; the the Río San Juan Antioquia, and Río San Juan Bravo Choco. This protected area extends from the lowland Chocó eco-region across the continental divide, down the eastern Andean versant with elevations between 1,700-2,800 meters. 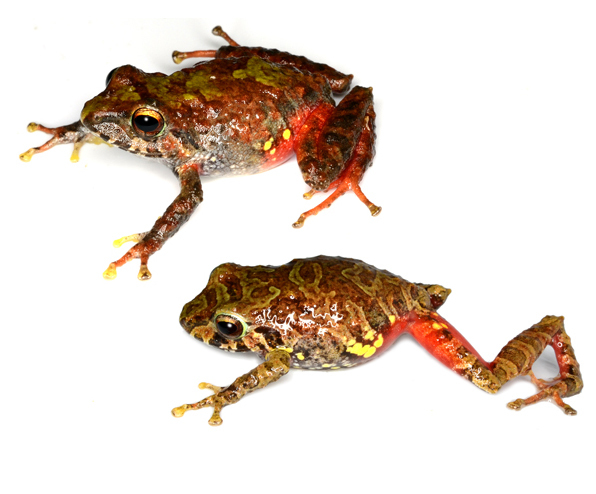 Initial survey findings made during NCFs August 2011 expedition to Reserva Natural Mesenia-Paramillo of amphibians found some <15 Pristimantis sp., 0ne Andinobates sp., two Rhinella sp., one Atelopus sp., one Bolitoglossa sp., and several species of Hylidae. 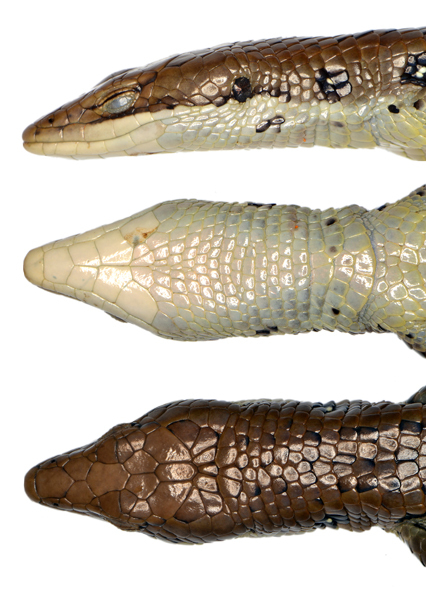 We found many reptile species, and for some species many individuals were encountered; one species of Anolis, one species of Cercosaura, one species of Anadia, two species of Tantilla, one species of Tricheilostoma, one species of Liophis, one species of Dendrophidum, one species of Lampropeltis, one species of Bothriechis, one Dipsas sp., three species of Atractus, and one species of Saphenophis. Several of these have been confirmed as unknown to science, and we are working on the manuscripts describing them. Several of our observations represent elevational records and range extensions that are also being written for submission to peer-reviewed journals. Additionally we found several small mammals of note; several Cryptotis colombiana, and a shrew opossum (Caenolestes fuliginosus), as well as two other small mammals we are in the process of identifying to the species level. Hummingbirds here at Reserva La Mesenia-Paramillo are numerous and stunningly colored, 14 are IUCN Red Listed threatened species. Arthropods at Reserva Natural Mesenia-Paramillo are mind-boggling. Our inventory barely scratches the surface with nearly 300 species collected and photographed, only a fraction have been diagnosed to species level. This work is ongoing. Orchids here are also numerous and are being catalogued. 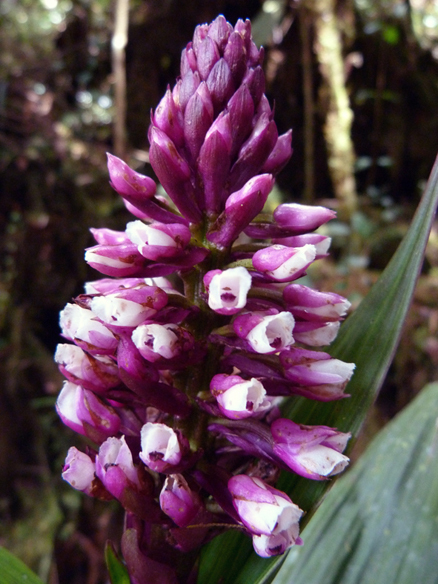 To date some 100 plus species of orchids have been found; Six species in the genera Elleanthus, Telipogon, Stelis and Pleurothallis appear to be new to science. Descriptions of these species are underway. We are currently working with the Nicholas School of the Environment, Duke University, and Colombian colleagues at the Instituto de Ciencias Naturales and the Universidad de Los Andes, Bogotá to complete the scientific species descriptions and other peer-reviewed publications generated from the expedition. Orchid, Ellanthus sp. nov. © 2011 Luis A. Mazariegos. Pristimantis sp. at Reserva Natural Mesenia-Paramillo. © 2011 Luis A. Mazariegos. 'Bromeliad lizard', Anadia species. © 2011 Luis A. Mazariegos. 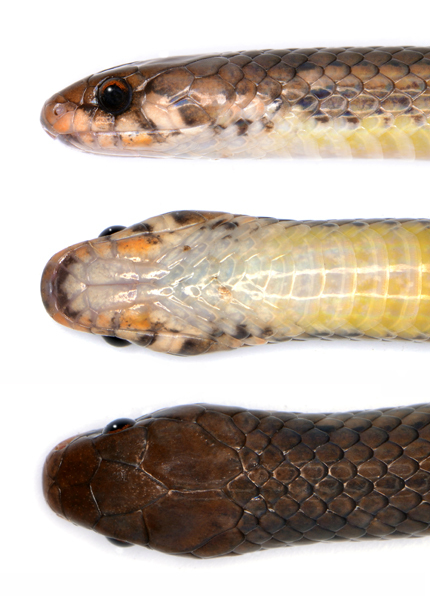 Black headed snake, Tantilla sp. © 2011 Luis A. Mazariegos. 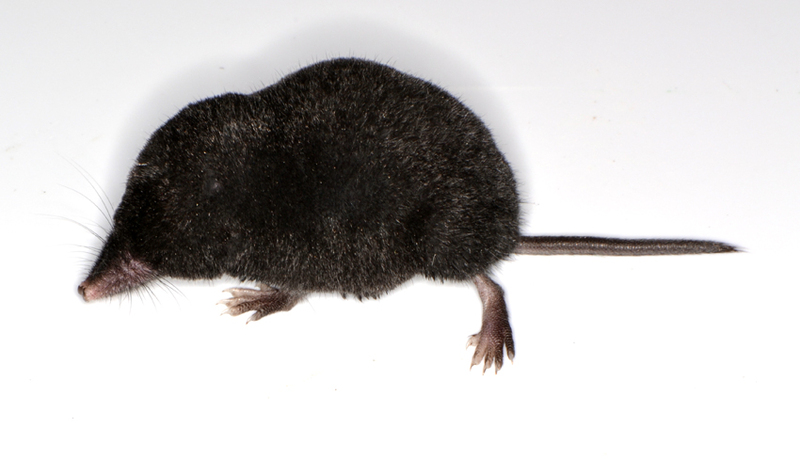 Short-eared shrew, Cryptotis colombiana. © 2011 Luis A. Mazariegos. 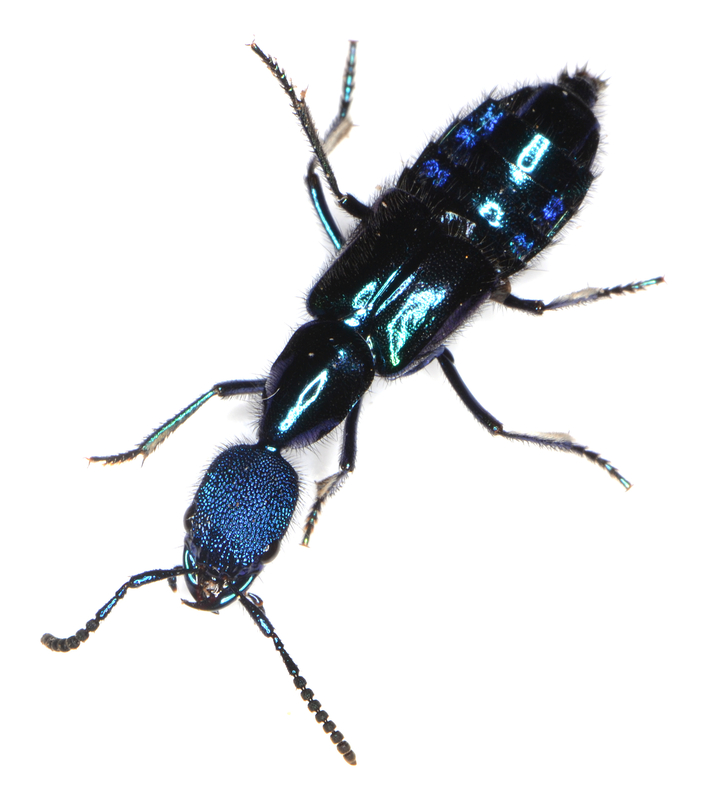 Rove beetle, Plochionocerus simplicicollis. © 2011 Gustavo Suarez. Reserva Natural Mesenia-Paramillo maintains about a dozen full and part-time employees from within the nearby community of La Mesenia where there is little to no long-term employment. These resilient and wonderful people function as guardabosques, parabiologists, carpenters, maintenance workers, cooks, and station managers. We offer them training free of charge, provide cameras, field equipment, as well as guidance in field techniques, making scientific collections, and managing the corresponding data to museum standards. We also conduct, again free of charge, environmental education courses on a variety of topics within the community of La Mesenia for both children and adults. None of this work would have been possible without their passion and enthusiasm for the Reserva Natural Mesenia-Paramillo. 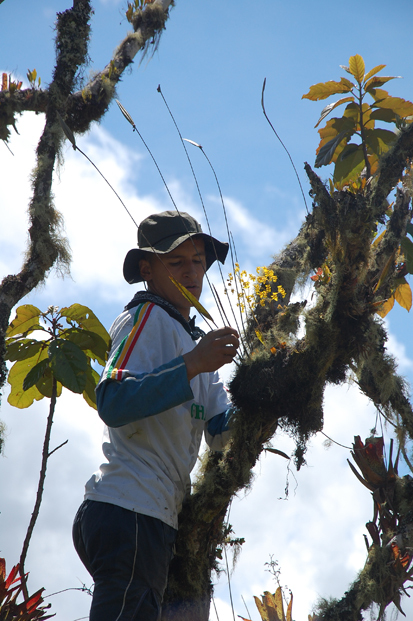 Juan, one of La Mesenia's residents and Reserva Natural Mesenia-Paramillo parabiologist and guardabosque collects an orchid species as he continues to catalogue their diversity here. © 2011 Ted R. Kahn. 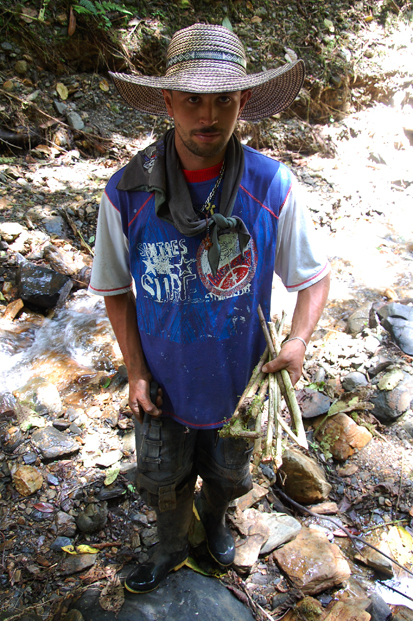 Jorge, one of La Mesenia's residents and Reserva Natural Mesenia-Paramillo parabiologist and guardabosque cuts stakes to hold the bottom of a drift fence in place. © 2011 Ted R. Kahn. 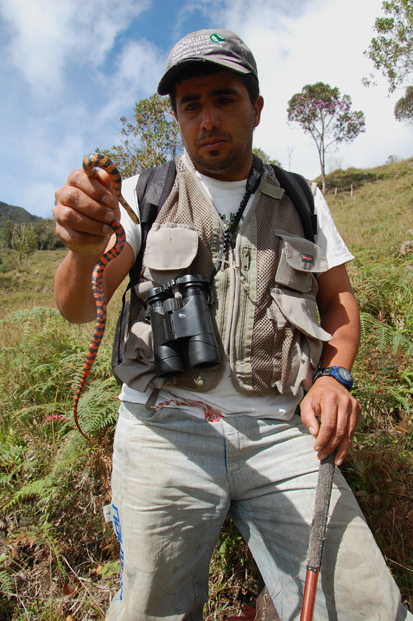 Gustavo Suarez is the station manager at Reserva Natural Mesenia-Paramillo, as well as an exceptional ornithologist, field parabiologist, and guardabosque, he is also quickly becoming acquainted with snakes. Here he is admiring his capture of a Liophis epinephelus pseudocobella. © 2011 Ted R. Kahn. We are grateful for support from The Nicholas School of the Environment – Duke University, Stuart Pimm and Saving Species, Luis A. Mazariegos, and all our in country and International supporters for making this continuing biodiversity exploration and conservation work possible. Join Reserva Natural Mesenia-Paramillo on facebook. This entry was posted on 10/19/2011 by neotropicalconservation. It was filed under Uncategorized . Love the post Ted. Keep up the good work.